Greenland Chase community in Jacksonville, Florida. Greenland Chase is conveniently located in Duval County on Greenland Road and I-95 / 9A. The community offers its residents distinctive home features and community amenities, all with a popular Mandarin address with access to nearby I-95, shopping, entertainment, health care, and restaurant. 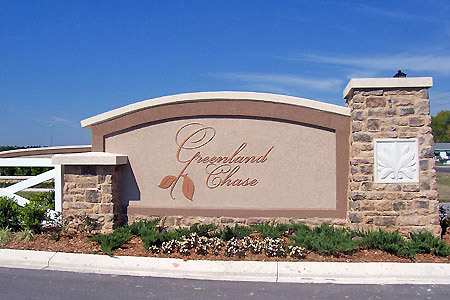 Greenland Chase consists of a total of 538 single-family homes at completion. Designed with active families in mind, the community features many wide winding sidewalks, a family amenities center, and is bordered by a large city park. The architecture of the community will attempt to support a timeless and traditional neighborhood feel with the majority of the homes being two-story and including such design features as recessed garages and front porches. Homesites available for 40', 50', and 60' lot. The homes will range in size from 1900 to more than 3000 square feet. Greenland Chase boasts a convenient location with I-95, 9A, I-295, and Phillips Highway all within immediate proximity. The Avenues Mall is only minutes away and popular destinations such as downtown and the beaches are easily accessible.